"Welcome to Paradiso. The future abhors purity. The future is a melting pot--especially so when the world's truly ending. Where you come from won't matter anywhere near as much as where you're going." Dystopias have always been a morbid warning to ourselves, a vision of a not so distant time where all our greatest failures and fears come true. From Blade Runner to The Hunger Games, desolate futures have been a fixture in our fictional lives for decades. Often the one thing authors can't seem to imagine in these vast futuristic landscapes are people of color. 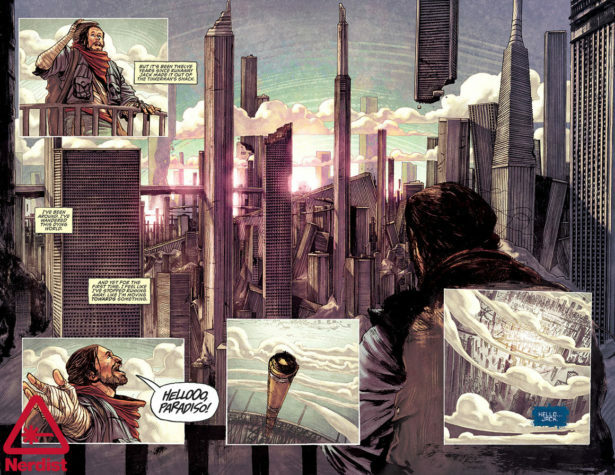 Image Comics' Paradiso is here to change all that. Created by Ram V and Dev Pramanik, alongside colorist Dearbhla Kelly, and letterer Aditya Bidikar, the book showcases a vast (and literally) living city, one that reflects the world around us and its creative team. For Ram V, this level of inclusion was always his intention. "It was important for me to create a future society that reflected the cosmopolitan nature of populations that exist now in large cities. Paradiso, after all, is set in a future city and to imagine one that isn't a mixture of people from all over the world is to suffer from cultural myopia," he told us. "Most of my human characters come from a variety and mixture of racial backgrounds. It might sound like a minor thing from the outside, but the sci-fi/fantasy stories I read when I was growing up never featured a character of Indian origin in a key role. When I first began writing stories, I named my characters Kirk and Michael and Jane and Lois. There's nothing wrong with that, of course, but I questioned why I instinctively reached for those names and backgrounds. I realized that the canonical English literature in India still carried its colonial baggage. There simply was no reason for me to continue doing so." From the outset, artist and and co-creator Dev had a clear vision for the world the team were creating. "Visually and narratively speaking, we have attempted to paint Paradiso as a dystopia that looked like dystopia. People of all backgrounds and origins in one place together, because there simply isn't another place to be in. We are all constantly inputting personal touches into our cast and the people in the world. People who have all banded together for better or for worse. Although it wasn't the focus of the story, I feel like creating a world where the actions of people are more important than their origins and their ethnicity is something that is a nice message to send out," Dev told us. A project long in the making, Paradiso's process was an organic one. Its origin story began in the thriving indie comics community in India where Dev, Aditya, and Ram first met. Originally a concept thought up by Ram and a friend, the seed grew into a book after meeting his collaborators whilst working together on 2015's Black Mumba. The trio soon realized that they wanted to create more books together and began talking about Paradiso in 2016 before pitching it to Image at Leeds' Thought Bubble festival. Dearbhla joined the book halfway through the first issue, completing the team. "I love the fact that it all works as a singular vision. You can't really tell where Dev's inks and textures end and where Dearbhla's begin. Or whether the SFX are drawn by Dev or Aditya. The script too goes through extensive changes before it attains its final shape," Ram enthused. The first issue of Paradiso introduces us to the sprawling world, a rundown yet hopeful place filled with life, not only because the city itself is alive. "The first issue is both a question and a promise, really. You get the reader to buy into your question with the promise of an answer. And then you spend the rest of the story delaying answers or presenting only those that raise even more questions," Ram teased. "I'm sorry if that sounds vague. I wish there was an actual mechanism to point at. But there isn't one. I know what my reveals or answers are going to be. I know where they lead and what questions they pose in turn. Once I know that, the trick is to get to each of those, elegantly," Ram expanded on his process. "Beyond that, there's theme. The big question. The philosophical inquiry that lends gravity to the story. But that's like a mountain in the distance. You can't tell exactly where or how you're going to climb it--only that there's this big question at the horizon and all you can do is try to walk toward it. Eventually, when you're close enough, the way up becomes clear." With life slowly edging closer to the dystopian futures we see rendered in pop culture, for Dev it's the human story that keeps fans interested in these often bleak stories. "Adversity brings out the true natures of people. I believe that's why people love dystopias so much. Great characters who become complex and twist and turn in ways beyond the normal spectrum of human nature, be it good or bad. But also readers are drawn to a mysteriously ruined world and wonder what led to this downfall, and whether society can somehow return to normal. For a dystopia to work, both the spectacle and the underlying human story needs to be balanced, and I believe that's what drove us to create, because we had both the intimate human story and the spectacle to wrap it in," Dev revealed. It's important to note that Paradiso isn't the bleak post apocalyptic retro-future of the past, as Ram revealed to us. "Paradiso isn't entirely a dystopia. If anything, Paradiso is a haven for those who live inside her. So even in this grim new reality that we present, people are trying to rebuild, to find their new normal. And perhaps, so is Paradiso--trying to build this newfound relationship with her own citizens," Ram professed. We spoke with the Bensons about Batgirl and the Birds of Prey. Check out this week's must-have comics in The Pull List! And finally, here are 7 comic book stories to inspire the writers of the X-23 spin-off movie!